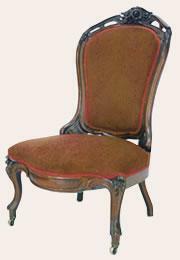 Antique Slipper Chairs can include any sort of low, upholstered, armless chair. Usually 2-3 inches lower than a dining chair. 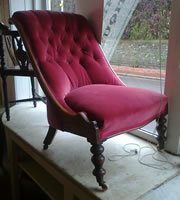 Often featuring a very high back and wide seat. Most slipper chairs date from the first half of the 18th century - sold singularly or in pairs, usually for use in the bedroom or boudoir. 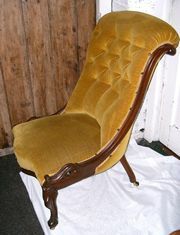 The style became popular in the 19th century, and had something of a revival in the mid-20th century.